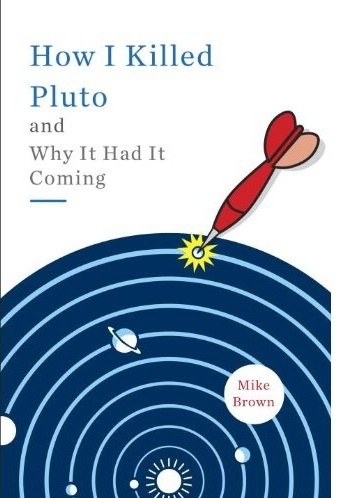 Mike Brown's Planets: So is Pluto a planet after all? So is Pluto a planet after all? The simple obvious answer to this question is no. Pluto was not demoted in 2006 simply because it was no longer the largest known object beyond Neptune, but because it was one of many many such small objects beyond Neptune. The fact that it might still be the largest gives it some bragging rights at the next dwarf planet convention, but – just like we never considered Eris a planet when we thought it larger than Pluto – being the largest known thing beyond Neptune doesn’t get you an invitation to the planet ball. The solar system is a beautifully and profoundly ordered place, a systematic product of the seemingly chaotic processes that formed it 4.5 billion years ago. Back before there was a sun at all, there was just a slowly spinning cloud of gas and dust gradually collapsing under its own weight. As the cloud collapsed more and more it began spinning faster and faster and flattened itself out into a pancake-shaped disk. 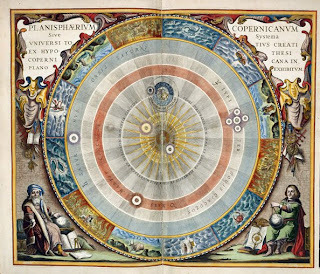 The vast majority of the material fell towards the center and created the centerpiece of the solar system: the sun itself. But the material still left in the disk slowly and randomly began to stick together and accumulate into a smaller number of ever larger bodies. The largest body in any area began to get so big that it had enough gravity to pull in all of the smaller bodies and all of the remnant gas in its vicinity. The more material that these largest bodies pulled in, the more circular and disk-like their orbits became, until, over millions of years, there were only eight such things like them left. Mercury, Venus, Earth, Mars, Jupiter, Saturn, Uranus, and Neptune are each the product of this long-term accumulation process, and each preserves the memory of these earliest times. After having pulled in so much material, they all are on nearly circular orbits in nearly the same disk, and each is so large compared to anything else in their immediate vicinity that nothing exists which can kick them out of their stunningly regular journeys around the sun. But the eight planets are not the only things out there. In some spots in the solar system this accumulation process never had time to finish. Just outside Mars, Jupiter was so nearby and so big that it kept trying to tug the material of this region towards it. Jupiter never quite succeeded in grabbing all of that material, but it did enough damage to make sure no planet ever got to form there. Rather than a single regular body in an orbit circling the sun in the same disk as the planets, the solar system at this spot now has an asteroid belt consisting of countless tiny bodies on tilted elongated overlapping orbits flying everywhere through this region. Jupiter continues harassing these asteroids to this day. 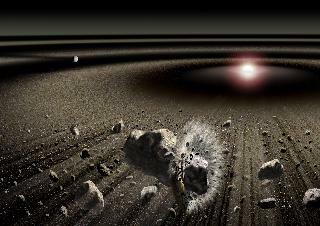 If an asteroid finds itself in the wrong spot at the wrong time it could be flung onto a new orbit causing it to smash into a rocky planet or burn up in the sun or even get ejected from the solar system entirely. Really, Jupiter does not do this harassing intentionally. It’s just a planet. And planets are generally too big to notice all of those other tiny bodies that they are pushing around the solar system. The asteroids are as different from planets as the krill moving around the ocean currents are from a pod of migrating whales. Beyond the planets lies another region of disorder. At the far edge of the solar system Neptune grew too big too fast and had the same effect on the small bodies growing out there as Jupiter did in the inner solar system. Beyond Neptune these small bodies never got much of a chance to coagulate into larger bodies at all. Instead, they were pushed and tugged and kicked around by Neptune until they, like the asteroids, were on bizarrely tilted elongated overlapping orbits, only more so. Pluto’s once bizarre-seeming orbit, which is tilted by nearly 20 degrees and is so non-circular that the most distant spot in its orbit is nearly twice as distant from the sun as its closest spot, is thoroughly typical of the other objects out in this region. Eris is tilted by 45 degrees and goes almost twice as far from the Sun as Pluto! In this region – what we now call the Kuiper belt – the disorderly small bodies, which were never allowed to accumulate into a dominant planet, swarm around and hope they never get too close to Neptune, which could either kick them out of the solar system entirely, or shove them into the inner part of the solar system to eventually burn up as quickly melting comets. Our solar system has a lattice of profound order with a background of swarming seething chaos. Saying that there are eight planets is simply a short-hand way of recognizing the intense difference between the eight objects which make up this methodical lattice and the millions upon millions in the swarming background. Pluto, whether it is a bit larger or a bit smaller than Eris, will always be part of the swarm. It will always be different from the eight planets. If you have a desperate nostalgia for the days when Pluto was still called a planet, it is possible to come up with scientific-sounding ways of categorizing objects in the solar system that would lump together the 8 planets with Pluto and Eris and perhaps a hundred other objects and call them all planets, but only if you close your eyes and shut your ears and ignore what the solar system itself is telling us. There is beauty in eight planets. There is order in eight planets. The solar system speaks its profundity in this regularity and stateliness. Letting go of Pluto has finally allowed us to be able to sit back and hear not only the quiet grandeur of the eight planets around us, but also, finally, the continuous buzzing of the seething background all around. There are billions of stars and nobody ever thought there was anything ugly in such a large number? Where are all the TNOs, discovery rates have been plummeting of late? And why this infantile notion of "demotion", as if confirming that dwarf planets are not as important as the Big Guys, thereby reducing the chances of missions to them getting much funding? Ceres, Pallas, Juno and Vesta were originally (in early 1800s) considered as planets (like Pluto later) but they were dropped from the list of planets when so many similar objects were discovered between Jupiter and Mars. After that they were commonly called "asteroids" or "minor planets". In 2006 Ceres became a "dwarf planet". "At the far edge of the solar system Neptune grew too big too fast..."
This contradicts the Nice model, which has Uranus and Neptune forming much closer in than they are now (with N inside of U), then migrating outward. What's your opinion of that model? Your argument is all very logical and well stated but you may never change he mind of a Plutophile. Pluto was one of us and we turned our back on it for being different. Yes, I have anthropromorphized our friend Pluto. But the problem is the definition of a dwarf planet as it is now is absolutely ridiculous. If a definition is such that Earth can be a planet at its current location, but would be a dwarf planet at the orbit of Pluto, then that's a poor definition. I'd rather have a nomenclature where all the TNOs are considered planets rather than the illogical and arbitrary system we have now. @anon 1: actually I'm a big fan of the Nice model. It's just hard to explain it quite as succinctly! @anon 2: You make a classical logical mistake here. You take a aesthetic classification preference ("earth at Pluto's distance should be a planet") and say that any classification that doesn't agree is illogical and arbitrary. Clearly not true. You do not LIKE it. But it is quite logical and definitely not arbitrary. That said, I think your comment actually exposes some of the beauty of the real, as opposed to hypothetical, solar system. There ISN'T an earth-sized object in the Kuiper belt. Why not? Because the solar system is an orderly place that formed in a particular way that does not lead to Earth-sized things in the Kuiper belt. Asking your hypothetical question makes no more sense than saying "what if we found something the size of Jupiter that was shaped like a cube." Take particular note of the "Questions and Answers" section: "Is that all, only eight planets?" "No," they reply, and proceed to mention the dwarfs. So, my personal answer to "How many officially recognized planets are there in our solar system?" is "8+5". Not "8", and not "13". At the end of the day, it all comes down to semantics. I prefer to think of "dwarf planets" as just small planets which don't dominate their orbital zone. After all, they've reached hydrostatic equilibrium, so the term "planet" gives us some idea of their physical structure. Others, naturally, prefer to think of "dwarf planets" as a completely different class of bodies due to the dynamics of their orbits. However one labels them, it reflects the same physical reality: Relatively small objects grouped in with a lot of other relatively small objects. As the "8+5" implies, I'm not inclined to number the dwarfs in with the main planets, except as a mental exercise. An expression like "the thirteenth planet" is going to be subject to a considerable amount of change as new dwarfs are officially recognized and added to the list. It's going to be a constantly moving target for possibly decades to come. Will we ever be sure we've found them all? P.S. I don't have a conceptual problem with defining the larger moons as "satellite planets", reflecting yet another dynamic class within our solar system. That would give us, what, "8+5+19" planets? But that's enough for one day. Also 8+5 should be 8+200. It baffles me to this day why the IAU defined dwarf planets to be anything in hydrostatic equilibrium and then declared -- when they clearly knew this to be wrong! -- that there were 5. I ♥ the KBOs, but you definitely ♣'d Pluto. "what if we found something the size of Jupiter that was shaped like a cube." "And you're going to be terribly disappointed when you eventually reach some of the other planets, although Pluto is quite interesting, being the home of the biggest creature I ever created, the Glarriper. An interesting beast with some remarkable mating habits. But enough! I don't want to spoil the surprise." (1) How big is Pluto really, minus the size of the Glarriper? (2) How come God didn't know that Pluto isn't a planet? I kind of like the term icey bodies. The word "planet" has dropped in prestige because of the discovery (and certain future discovery) of many, many, many more planets. We will have to either start naming them after common folks like you and I or create new lore or mythology just to provide the planet with a proper noun name. I disagree with the IAU's definition of what a planet is, but that is water under the bridge. I think anything with a density of 1 kg/m3 or more and a diameter or girth of at least 1,000 miles automatically constitutes a planet. Even Saturn has a density of at least 1 kg/m3 somewhere within the planet. A planet's overall shape or location should have no effect on its classification. You could have KB planets, Oort Cloud planets, Planet Orbiting planets etc. To no disrespect to all of those Pluto huggers out there, Eris, even if it is a 100 inches or a 100 miles smaller in diameter than Pluto, does not diminish Eris in any way. That is because Eris seems to be around 27% more massive than Pluto which means that it has more in common with terrestrial planets like Mercury and Mars than with Pluto, which seems to be more like a planet-sized comet. Anonymous wrote: "But the problem is the definition of a dwarf planet as it is now is absolutely ridiculous. If a definition is such that Earth can be a planet at its current location, but would be a dwarf planet at the orbit of Pluto, then that's a poor definition." --I don't think it is quite this simple though. For one thing, I think the current thought is that if we did find an earth in the Kuiper belt, it would have a fairly circular orbit and will have swept its environs clean of debris, so if we found such a planet there, it likely would not be classed as dwarf planet. The term dwarf planet does not mean "anything in the Kuiper Belt", which is why Ceres is a dwarf planet even though it is found in the asteroid belt: it is massive enough to have a spherical shape, but not massive enough to have swept its orbit clean. Secondly, I suspect that the current theory predicts that we WON'T find an earth in the Kuiper belt, thus if we do, the classification system will indeed perhaps be rethought, i.e. the current system is testable, and not entirely arbitrary. Unless I misunderstand the whole thing? Anyway, the solar system has not been changed. Only our understanding of it has changed. I don't think it is at all a bad thing for our classification systems of natural phenomena to reflect our latest and presumably best understanding of the phenomena in question. Hi, i just recently came across this article " Our "New, Improved" Solar System"
What is your oppinion on this new theory of the development of the solar system? "We don't pretend to legislate what makes a planet, but we have different naming committees for different types of body. The rule for deciding which committee gets what will be [insert empirical rule such as H<1 here]. Individuals with an agenda to push are free to make what they will of this." My favourite quote from the whole debacle comes from one of the informal meetings in Prague (can't remember where I found it now). One astronomer said something like "So what we have to decide is whether the answer to the question 'Is Pluto a planet' is 'Yes, it's a dwarf planet' or 'No, it's a dwarf planet'" to which someone else retorted "That's exactly the kind of ambiguity we want." Oh, and a belated haiku in celebration of the Eris occultation result. Eris is only the queen. A bit like in chess. That's actually a great way of putting it - I had already been explaining it to people that Pluto was now no longer the runt of the planetary litter (even if you mashed it and Charon together, it would be completely outdone by Mercury and several different moons), but the King of the Dwarves. With their little vassals Charon and Dysnomia running around after them. Or are they maybe the children - a son and a daughter? Plus the babes-in-arms (or maybe pets? dogs, cats, puppies, kittens??) of Styx, Nyx, Hydra and Kerberos. It's a happy little Kuiperan royal family. Then the rest of their court making up the numbers... distant cousin Ceres keeping watch over her hinterland princ(ess)ipality... Triton, in a doomed civil partnership with Neptune... Sedna, the wandering knight... and all the other princes, princesses, dukes, dutchesses, sheriffs, knights, ladies-in-waiting, jesters, et al. With the smaller asteroids being the everyday peons. And the major planets and their moons maybe counting either as the royals of much larger humanoid species, or just the straight-up gods, titans, and other ethereal spirits that they're named after. Pluto and Eris having been given them as a bit of monarchial grandeur by whoever their parents might ultimately have been. And of course... in Chess, the king may be the most important piece that you have to protect ... but it's the queen that actually holds your team's greatest power. This is very interesting & help to open the door which was close till today.It will guide all astronomer & will help to imporve our knowledge database. My suggestion would be to change the orbital clearance thing to "the object must have a higher mass than Ganymede". Thing is, if Ganymede was cut loose, it might actually count as a Proper Planet. That's why you make the definitions so that they can be applied without reference to any existing body, but in a universal, objective way. "Is the largest thing in its orbital zone and therefore is the one that does the local perturbing, rather than being perturbed; identifiable by how, after several billion years, there's nothing left either in its path or co-orbiting that's got any chance of causing it to experience significant deviation" is a bit of a sticky wicket, but it does the job well enough. If earth was in a tilted orbit would it be a DWARF PLANET, no. So what does a titlted orbit prove, NOTHING! Pluto is a PLANET! I think it would be a good idea to use the terms "dynamical planet" and "geophysical planet" - where a dynamical planet is a non-stellar body massive enough to clear its orbit and it is in orbit about a stellar object, and a geophysical planet (world) is a non-stellar body massive enough to be in hydrostatic equilibrium (would include dwarf planets and large moons). The IAU definition requires it to be both a dynamical and a geophysical planet. I'm curious - has the IAU provided a definition for "moon" and "ring"? And was there any controversy or any battling over semantics? Brilliant blog btw, I love it. Under the Nice model, aren't the only two planets Jupiter and Saturn, as everything else is in its current position after being scattered by them? Anonymous wrote: "If a definition is such that Earth can be a planet at its current location, but would be a dwarf planet at the orbit of Pluto, then that's a poor definition." The Stern-Levison parameter predicts whether or not a body will clear its orbit. Earth would clear its orbit anywhere out to 2870 AU. Pluto, however, would not clear the orbit if it was moved to where Earth is. Earth would be not a planet under the "Pluto is the 9th planet" definition if it was moved to where Ganymede is. We have two perfectly reasonable ways to organise these things. One is "biological", by the intrinsic properties of the object. Like mammals, reptiles, etc. The pure form of that classification system has Mimas as a planet, and interstellar balls. The other way is "sociological", by the behaviour or role of the object in the system. Like predator, scavenger, parasite, etc. The pure form of that shouldn't care whether or not the object is round or fusing. It's a planet if it orbits and dominates that orbit. A brown dwarf could be a planet of a large star. We can even call Ganymede a planet relative to the Jovian system, but not relative to the Solar system. After thinking carefully about the implications of the measurement of Eris diameter (along one axis) I still think Pluto is a Lagrangian, formed at the Sun/Neptune L4 or L5 point. When Eris was first discovered, you said that it was bigger than Pluto even if it reflected 100% of the sunlight that falls on it. I presume that still holds even though now we find that it does indeed reflect nearly all the light that falls on it. That the methane does not darken significantly after a couple of hundred years on the surface since the last snowfall is still pretty baffling. My "Size Matters" t-shirt has faded significantly after only a couple of years. The emulsion on the very first photograph ever taken was a hydrocarbon and required an exposure of only about 8 hours. Smog forms in a day. I've been reviewing what's known about KBO's recently and the most baffling mystery seems to be Quaoar. I think possibly one point on there is that the Point Spread Function didn't work out as being all that accurate at Eris and we can expect more error at Quaoar. I don't know. I'm still "thinking". @omnologos, there was a huge fight in Congress over funding the New Horizons mission. So it was sold as "the first mission to the last planet". I guess the legislators were kind of reluctant to fund space missions so they started saying anything sub-planetary wasn't worth going to. Now New Horizons fans are stuck defending the planethood of Pluto. Pluto is much more important as what it is than as a pseudoplanet. There's a whole new GROUP of worlds out there. @Mike -- Last night I re-read S. Alan Stern's predictive paper that was published in around 1991 in "Icarus" vol. 90, in which he said essentially that there must've originally been upwards of 10,000 Pluto/Triton/Charon-sized bodies in the space 20 to 50 A.U., and that almost all of them got kicked out by Uranus & Neptune -- a few to the Kuiper Belt, but at least 97% all the way to the Oort Cloud (I think this paper was published a year or two before Jewitt and Luu made the first discovery of a KBO). Altho Stern was expressly writing regarding what he called 1,000-km.-class objects (I assume he meant radius as opposed to diameter), if his analysis was valid, isn't it likely that there were at least a few larger -- perhaps much larger -- objects kicked into the Oort Cloud in that early era, where they still lurk today? And if so, couldn't one of these larger objects account for Sedna's bizarre orbit? Of course, the main argument against the existence of such a large object is that you and your group haven't found it -- so tell us, if such larger object(s) DOES/DO exist way out in the Oort Cloud, what's the chance that you haven't found it yet? Asteroids and TNO:s are planets. They are minor planets, because they do not dominate their orbits like the massive 8 ones. PS: Ceres, Pallas, Vesta, Hygiea and Juno are best! I would think there are still larger objects out there. Why stop at Pluto/Eris size? Perhaps something as large as the moon is out there. At the risk of returning to last month's topic, is Sedna a planet? It has a clear orbit, and it goes around the Sun. Just to add fuel to the fire of this discussion, what would you call an object that meets all of the requirements to be considered a planet, but it resides in the Oort cloud and does not orbit the Sun? How is it that according to the IAU, a body must have enough influence to clear its orbit, yet some planets, like Neptune, attract objects (from the KB) such as Triton? What if Triton slipped into an orbit around the Sun, but not around Neptune? Would Neptune kick it back to the KB or would it tug the planet sized object toward it? What causes some objects to be tugged (toward a body), while others shoved (away from a body), i.e. Triton was supposedly tugged to Neptune (from the KB) while just about every other KBO, including Pluto, was shoved into the KB; what gives? If the Oort cloud was clear, it wouldn't be a cloud. I agree with mig225; we need an universal definition or classification, if you like, that can be applied to more diverse objects and environments. Maybe it will emerge in the coming decades, as we discover more and more extrasolar systems. @Mike: "That said, I think your comment actually exposes some of the beauty of the real, as opposed to hypothetical, solar system. There ISN'T an earth-sized object in the Kuiper belt. Why not? Because the solar system is an orderly place that formed in a particular way that does not lead to Earth-sized things in the Kuiper belt. Asking your hypothetical question makes no more sense than saying "what if we found something the size of Jupiter that was shaped like a cube."" Nice idea, but you say "the real solar system" as if there's only one. For all we know there are other solar systems where Earth-sized planets have been ejected through gravitational interactions from their orbits into their equivalent of Kuiper Belts. For all we know, something bigger than Mercury could be lurking out in the outer edges of the scattered disc, maybe! At that point we'd have a dwarf planet bigger than a real planet, and then our classification system would really get confused. I'm not willing to enter into any debate over this seemingly endlessly-debatable topic concerning nomenclature of OUR solar system (you know the system that is Sols rather than the Vegan system etc) but I would like to air my support for Mike Brown's text in the main body above describing the simplest view of how our solar system formed. 8 large objects that circularized their orbits while growing in size through accretion, versus the myriad left-over rubble that remains from the building-site that was the early solar-system. Such a simple view and intuitive one. I will freely admit that in 2006 I became saddened that Pluto, the 'oddball of the planetary family' was changed in it's description but I wholeheartedly saw the common sense and logic of that decision. People who take umbrage against the term 'dwarf' really are making the mistake of over-reacting and taking things personally as if it is an attack on their intelligence. See past the English-language terms and embrace the underlying concept. I would like to add that when we finally get to image objects as small as 100km in size around the many extrasolar systems out there we will clearly be able to see their asteroid belt(s) and Kuiper belt(s) and the orbits those many, many objects occupy and we will be able to apply our common sense once again to classify them similarly. Perhaps this debate will wind down soon... after 5yrs I'm still surprised so many people keep a fond miss-classification of Pluto so close to their hearts and take things so personally rather than seeing the 'bigger, ordered picture, outlined at the top of the page. Pluto crosses Neptune's orbit, therefore Neptune hasn't cleared its orbit, so it's not a planet? Jupiter has over 6,000 trojans in its Lagrangian points, so it's not a planet either? Pluto has to clear a vastly larger orbit. We found a Kuiper cliff where there should be KBO clutter. Almost all of the other KBOs are too small even to be spherical. Jupiter has 67 moons but we didn't require a new classification for dwarf moons. In the future, when the Earth and Moon are tidally locked and orbit an external barycenter, will the Earth be demoted too? 8 planets, all completely different, some small and rocky, others vast and gaseous, but classified as one because... their orbits, unlike Pluto, are in a nice, tidy plane? Rocky planets, gas giant planets, ice giant planets, dwarf planets... they are all sub-classes of planet; dwarf rabbits are still rabbits. Hopefully New Horizons' incredible discoveries will reinstate Pluto to its rightful status, along with Eris as the tenth planet. How big is Pluto, anyway?